During his stay in Australia Matthew Moss visited the tropical rain-forests on Queensland's Great Barrier Reef. The journey by train from Melbourne to Brisbane and northward to Tully, reputed to be the second wettest town in the world was long and tiresome. Some 52 kilometres north of Tully the artist alighted at Innisfail a small town considered to be the second wettest town in Australia. Here Matthew camped out in the bush at Mission Beach for three months and produced, amongst other canvases, 'Mangrove Swamp on Queensland's Great Barrier Reef''. 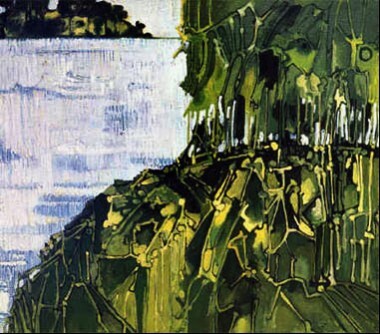 The manner in which the artist has reduced the mangrove foliage to iconic shapes show the artist's indebtedness to the Chilean-born Surrealist Roberto Matta. The mangrove trees and the leaves and vines are indicated by sometimes borrowing the symbols he used in the mid 1960s Roman paintings. Despite Innisfail's tropical climate and reputation of being humid, warm and always raining the artist found it an ideal climate for working outdoors. The tropical rains fell, usually, only at night making the working day fresh and most pleasant. The green and yellow vegetation mass on the shore frame against the vast Coral sea. Dunk island is seen in the background. On occasions, as the artist painted outdoors the only sign of movement would be the great white-headed Sea eagles Stuka-diving the surface of the sea and lifting off again with, held in his beak, a large fish to deposit on a nearby rock. A number of artists worked and lived in the bush in Innisfail in an Arcadian tropical ambient that would have aroused the envy of Paul Gauguin. The humid warm weather was, however, a serious disadvantages for painters whose paintings, both the canvas and the paint layer, were constantly attacked by mould causing them to decay rapidly if the artist did not ship the finished work out of the region quickly.